We’ve seenthe clenched fistsof the communists as they assemble to cause mob violence, destruction and havoc. The clenched-fist salute has been used among revolutionaries for many centuries as a symbol of defiance, comradeship, and solidarity. It was employed during the bloody French Revolution of 1789, and again during the industrial revolutions of 1848. It is the same clenched fist seen in the Russian Revolution of 1905 when a wave of mass political and social unrest spread through vast areas of theRussian Empire. The rage was directed at the government, the Tsar, the church and other conventional authorities. Vladimir Lenin’s Communist Russian Revolution culminated in 1917 when the Tsar became the U.S.S.R. (Union Soviet Socialist Republics). In July of 1918Tsar Nicholas Romanov and his family were executedon the orders of Bolshevik leader Vladimir Lenin. In recent history, the communist clenched fist has been used by the Black Panthers, Black Lives Matter, AFL-CIO labor union members, Occupy Wall Street activists, Marxist-Leninists, including members of the Communist Party USA and the Revolutionary Communist Party, and now by the ski-masked Antifa thugs of the Democrat party. In this picture, (not included herein) German members of Antifa, a Soviet front group that carried out violence and intimidation, give clenched fist salutes on September 1, 1928. The Soviet Unionwas among the world’s most violent dictatorships, killing an estimated 20 million people, according to “The Black Book of Communism,” published by Harvard University Press. The Soviet regime is second only to the Chinese Communist Party under Mao Zedong, which killed an estimated 65 million people. The Antifa organization can be traced to the “united front” of the Soviet Union’s Communist International (Comintern) during the Third World Congress in Moscow in June and July 1921, according to the German booklet “80 Years of Anti-Fascist Action” by Bernd Langer, published by the Association for the Promotion of Anti-Fascist Culture. If you think it can’t happen in America, just look at who is funding these anti-American mobs bent on the destruction of America’s Constitution, her culture and way of life. She is under siege by a group of masked, black-clad protesters known for using extreme violence and intimidation to silence conservatives and they have an agenda promoted and funded from behind the scenes. The Revolutionary Communist Party (RCP) is a largecentral player in Antifa violence. In North Dakota, for instance, Antifa tried to block theDakota Access Pipelineby burning and bombing bridges, threatening local residents and killing cattle. One “peaceful protester” tried to shoot a deputy sheriff. The left’s rage against conservatives is much more strident and rabid than that of the right against them. Their nihilistic narrative lends itself to distorting reality. Our social fabric is torn, and as such, many writers believe we are headed for a new civil war. But it is not a civil war we’re headed for…it’s another communist revolution, one like 1917 Russia, and this is their “dress rehearsal.” This is the new Red Army of Revolution, and they’re armed. Donald J. Trump upset the globalist New World Order apple cart big time. Their plans of leveling America into a third world country they could easily control have been thwarted by American voters, at least for a time. All restraint has been lifted, the socialist Democrats are showing their true colors. Nancy Pelosi (D-CA) recentlystatedthat if collateral damage happens against those who disagree with the political agenda of the Democratic Party, then “so be it.” Really Nancy? I bet Congressman Steve Scalise would strongly disagree with you. Maxine Waters committed sedition bycalling for violenceagainst the Trump administration and anyone who supports Republicans. Hillary says that the Republican party is “ideological” and “driven by the lust for power.” Hell yes, we’re ideological. We love the Constitution and the liberty ourFounding Fathersfought for; they succeeded in removing the shackles of tyranny. And all along the way, Liberty’s lantern was their guiding light. It is your communist democrat party Hillary that has the lust for power and will use obscene and vulgar actions against the Trump administration and his supporters. We never saw violent mobs attacking Obama and his administration during his eight-year reign. So, Hillary, who is really driven by the lust for power? What an irresponsible statement! She’s saying that violence by the left will continue until the Democrats regain power. She is promoting anarchy because they want their totalitarian societal control returned. The Gateway Pundit reportedthat after attacking five separate GOP offices, Antifa has escalated their extremist activities by placing severed pig heads at multiple polling locations and campaign offices in the Austin, TX area. The Red Guards Austin recently shared ablog postwith their 8,000 Facebook followers in which they commemorated Mao Zedong’s brutal communist revolution that resulted in millions of people being slaughtered. In thisblog post, they called for a boycott of the “bourgeois elections” and advocated for organized revolutionary violence. Breitbart’sarticle of October 17thexposes the Soros fundedRockwood Leadership Institutewhere political communists are trained. Florida gubernatorial candidate Andrew Gillum graduated from the Oakland, California-based training school for progressive revolutionaries that has spawned a list of activists who have gone on to become the who’s who of the far-left leadership world, with many taking senior positions at organizations financed by billionaire George Soros. Notorious radicals like avowed communistVan Jonesandcommunist Islamist Linda Sarsourare among the many famous names listed as alums. And Florida gubernatorial candidate Andrew Gillum, democratic opponent of Ron DeSantis, also graduated from Soros’ Rockwood Leadership Institute. Antifa is planning a November 4th, 2018 Communist Revolution throughout America almost exactly 100 years after the Bolshevik Revolution that took Russia out of the frying pan of Tsarist rule and into the fire of communist totalitarianism. 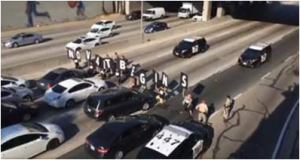 On Tuesday morning, September 26, the Antifa group ‘Refuse Fascism’blocked rush-hour traffic on the 101 freeway in CA for about a half an hour. Jim is right, and it would be wise for all Americans to be prepared and armed…and know how to use their firearms. This is not just opinion, it is factual. We don’t want a revolution, we still want the ballot box, not the cartridge box, but patriots must be prepared. Editor comment; as my memory serves me, long before the Soviet Union’s front operations to bring about communist dictatorship in Germany, the Russian Royal ‘Christian Family’ was savagely attacked and murdered by Bolsheviks (Anti-Christian). Check the history of such revolutions and of their ‘political’ slant and if ‘they’ took the guns away from the people and the number of people killed/murdered and if they were Christian or of Ashkenazin Khazars-Edomites and you will have the answer as to who’s who advancing this communist revolution and those involved in REPEATING HISTORY …ALL OVER AGAIN. I guess it’s true, that if people do not know the real history, they don’t see the STROM that’s now forming over America. (from Wikipedia); The House of Romanov was the seconddynastyto rule Russia, after theHouse of Rurik, reigning from 1613 until the abdication ofTsarNicholas IIon 15 March 1917, as a result of theFebruary Revolution. In early 1917 the Romanov dynasty had 65 members, 18 of whom were killed by theBolsheviks. The Bolsheviks, originally were afactionof theMarxistRussian Social Democratic Labour Party(RSDLP) [similar to the U.S. Democratic-Marxist-Communist Labour Party]which split apart from theMenshevikfaction[b]at theSecond Party Congressin 1903.The RSDLP was arevolutionary socialistpolitical party formed in 1898 inMinskinBelarusto unite the various revolutionary organizations of theRussian Empireinto one party.